Secretary of the Navy, Ray Mabus, is a left wing, cultural Marxist, whose social experiment policies are turning the US Navy into a feckless fiasco on the high seas. Mabus is responsible for pushing women into the Navy SEALs, Marine infantry, a new Orwellian gender neutral lexicon, Marine Corps Unconscious Bias Training, while also completely ignoring the Corps’ $36 million dollar study that showed why women can’t meet the rough standards of the combat arms and special operations. Mabus’s latest social experiment laboratory creation is the selection of Admiral Michelle Howard as Commander of US Naval Forces Europe. Howard was the former Vice Chief of Naval Operations until May 2016. In the past, the Commander of US Naval Forces Europe, like the Vice CNO, has always been an officer with a myriad of ship time, command experience and more importantly, an officer heavy on combat duty. Admiral Howard, though, has very little ship time, command time and no combat experience. She had command of only one non-capital ship, the USS Rushmore (LSD-47), a dock landing ship. She has held a plethora of shore assignments, including serving as the Action Officer and Navy’s liaison to the Defense Advisory Committee on Women in the Military Services (DACOWITS), Action Officer J-3, Global Operations, Readiness on the Joint Staff from 2001–2003; Executive Assistant to the Joint Staff Director of Operations from February 2003 to February 2004; and Deputy Director N3 on the OPNAV Staff from December 2005 to July 2006. Howard was the Deputy Director, Expeditionary Warfare Division, OPNAV staff from July 2006 to December 2006, and senior military assistant to the secretary of the Navy January 2007 – January 2009.She served as chief of staff to the director for Strategic Plans and Policy, J-5, Joint Staff from August 2010 until July 2012. From August 2012 to July 2013 VAdm Howard served as Deputy Commander U.S. Fleet Forces Command headquartered in Norfolk, Va. She served as Vice Chief of Naval Operations from July 2014 until May 2016. Her only other command time at sea includes command of Expeditionary Strike Group 2 and Combined Task Force 151 (CTF 151) aboard the amphibious assault ship USS Boxer in April 2009. Boxer was the flagship for CTF 151, a multinational task force established to conduct counter-piracy operations in the Indian Ocean. Once again, in a Navy career spanning 36 years, Howard has only commanded one ship, a dock landing vessel and served as the commander of an anti-pirate task force. She has never commanded a cruiser, a destroyer or an aircraft carrier. She has never been in combat, although she did serve in the Persian Gulf, aboard the USS Mount Hood, an ammunition supply ship. Howard was promoted to rear admiral (lower half) effective September 1, 2007 and to rear admiral, effective August 1, 2010. 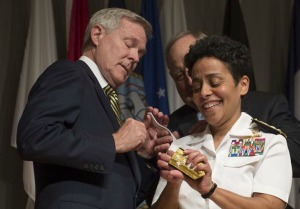 She was promoted to vice admiral on August 24, 2012. On July 1, 2014, Howard was promoted to admiral. The last three promotions came quickly and all while President Obama sat in the White House. Do you believe in coincidences? I don’t. After her last promotion, a former instructor of Howard’s, remarked that she was promoted for “capability.” In actuality, she was promoted to full admiral and to many other ranks up the ladder for diversity. Admiral Howard’s awards also offer a picture of her background, which is heavy on staplers, pens and paper and non-existent when it comes to putting cold steel down range. Her highest award is the Navy Distinguished Service Medal, which is bestowed upon members of the Navy or Marine Corps who distinguish themselves by exceptionally meritorious service to the United States government in a duty of great responsibility. She has no Navy Cross, Silver Star, Bronze Star or Purple Heart. She has no Navy Commendation Medal with a V for Valor device, because it’s hard to give out valor awards to Chairborne Rangers. Her other commendations are right out of the Diversity Playbook. She is the recipient of the 2008 Women of Color Science Technology Engineering and Math (STEM) Career Achievement Award, 2009 Dominion Power Strong Men and Women Excellence in Leadership Award and the 2011 USO Military Woman of the Year. On February 1, 2013, Howard was honored with the “Chairman’s Award” at the 44th NAACPImage Awards. She is a 1987 recipient of the Secretary of the Navy/Navy League CaptainWinifred Collins Award. Howard is obviously a decent staff officer, but was blatantly unqualified to be the Vice CNO and now the Commander of US Naval Forces Europe. It is clear that she has gotten as far as she has because she’s an African-American woman in a military run by feminists and left wing idealogues who are intent on destroying every last vestige of the US military we all knew and loved. You know; the US military that won wars.